A collection of essays originally published as a pamphlet entitled 25 years of Home-based Education: Research, Reviews & Case Material by Education Now Books in 2001 (1-871526-50-7). This version of the original has been lightly re-edited and includes the articles of the original publication. 1975 to 2000, is a distinctive era of home education in the UK. 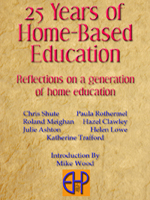 It covers the birth of home education as a mass movement through to the advent of the internet as a force both in terms of an explosion of educational resources and it’s use as an organisational, support and campaigning tool for pioneering families (1998 marking the first truly collaborative effort). For home educators, the period was defined by the relationship between home educating pioneers who took responsibility for the education of their children and their local authorities who mistakenly believed they were responsible for children’s education. The whole period can be viewed as being a long battle in which there were a great many minor skirmishes involving individual family’s interspersed with battle royals involving senior lawyers and professors of education. The most important of these was a protracted fight in the early 1980s between the Harrison family and Hereford and Worcestershire County Council Which ended in a partial victory by the Harrisons. This was important because the judge rulled that the Harrison’s version of autonomous education was valid thus confirming the appeal court ruling back in 1963 concerning Joy Bakers epic stand off with her local authority, Norfolk Educaton Authority. This work is highly relevent today. It contains summaries of foundational research that contradicts many of the assumptions around home education.